Akihabara branch 秋葉原　麺屋武蔵　武仁 Menya Musashi 麺屋武蔵 is a tsukemen/ramen chain with quite a few shops in Tokyo, each with its own special way of preparing the pork. 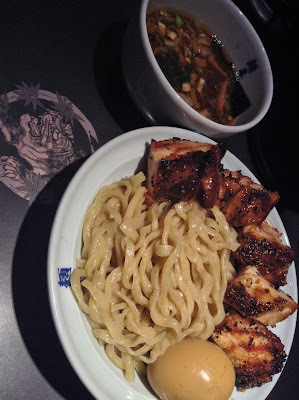 The decor is cool, the noodles are thick, and the dipping sauce is a mixture of chicken, pork bone, and seafood broth. We've tried 4 of their shops so far - all good! The Roppongi branch is down the side street next to Ichiran in Roppongi, close to the subway station. We had tsukemen and rice with pork - the fatty pork is just the best thing ever, seasoned and cooked to perfection & beyond our expectations! We ordered extra pork for 200 yen a piece. 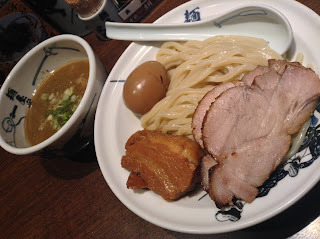 The tsukemen's sauce is not as thick as their original Nishi-Shinjuku store but still good. The noodles have bits of pepper in it but the flavor is quite subtle & the texture is similar to their other shop. The unique sugar yuzu vinegar sauce and spice with dried shrimp at the counter are both excellent additions. Seriously the pork is even more tender and uber delicious than the Shinjuku shop and that's already really good! 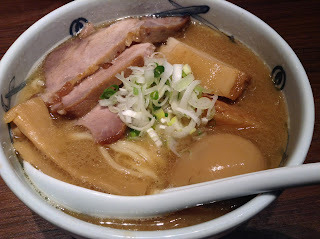 There are 2 Menya Musashi in Akihabara and the one called 麺屋武蔵 武仁 is behind Yodobashi Camera. Each piece of super tender juicy pork is over 100 grams and absolutely delicious! We ordered thick dipping noodles with twice the meat (濃厚武仁肉二倍つけ麺 tsukemen) for 1470 yen and even though the meat was amazing, 1 piece would've been plenty (it's so big!). If you pay an extra 150 yen, you can add more bits of pork to the dipping sauce but that's probably also not necessary - it's really hard to eat all that pork even though it's really good. Turns out there is such a thing as too much of a good thing. 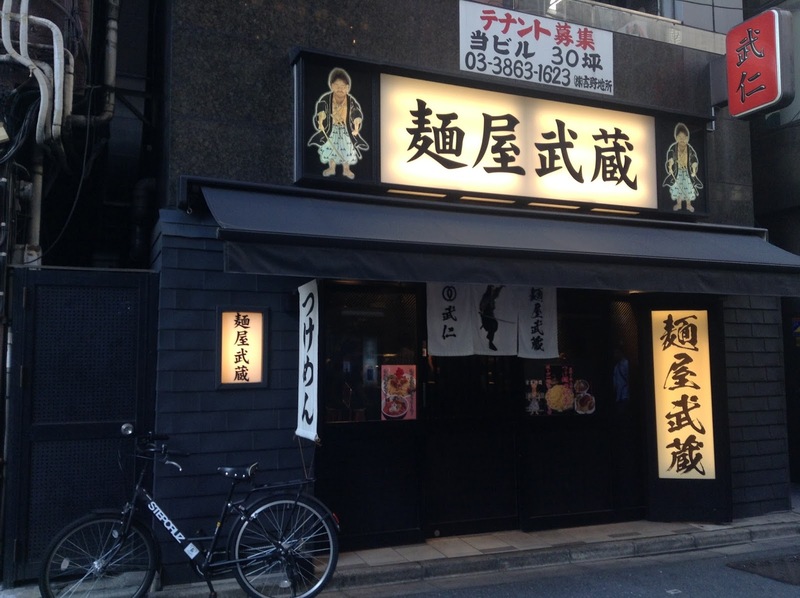 We still prefer the Roppongi branch but this one comes in a close second before the Kamata and Shinjuku branches which are both awesome. The Kamata branch 蒲田 has a much bigger shop, nice decor. The pork pieces are smaller than the Akihabara one but equally tender and perhaps even more delicious! Definitely go for the fatty pork instead of the flat pieces. Honestly, sometimes we just order rice with pork and not even bother with the noodles. If you feel bad about eating too much pork, there's a convenience store across the street where you can down some black oolong tea which reportedly may help unclog your arteries. The Tamachi branch 田町 is smaller than the Kamata one but with both counter and a few table seats. There are 2 types of pork, the thick fatty one is slightly too salty for my liking but still tender. 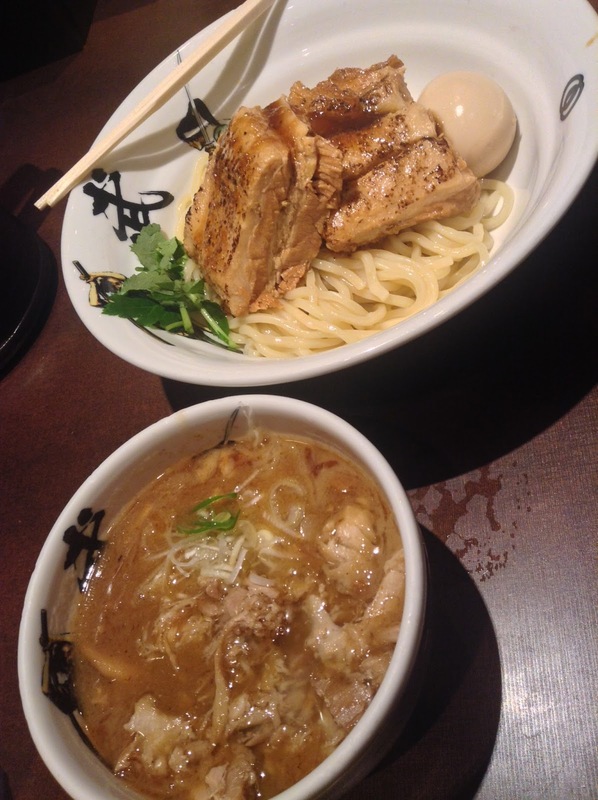 They have fish dashi on the counter to thin out your tsukemen dipping sauce to a drinkable soup. The red in-house sauce makes a great addition to the noodles!